What an interesting swap! Apparently matchbox swaps are fairly common on Swap-Bot and I am glad I found this one. Challenging both to make and photograph but you all know I LOVE a challenge. Consider this a spoiler alert if you are in the swap and wish to be surprised in case I am your partner. 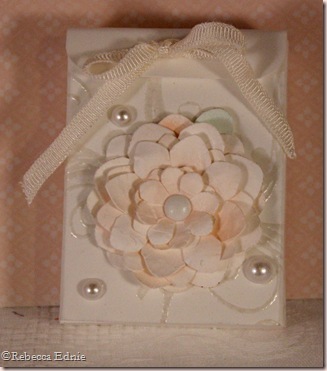 I started with plain white CS, cut out the template and heat embossed some flourishes with white pearls EP. It showed up much better than I would have expected. Then I constructed the wrap part of the matchbox; this style is called an envelope style because one end is closed and the other has an envelope style flap. Next I made the flower using the two smallest Dahlia Nestabilities. I cut two each of the smallest and second smallest; then I embossed two more large ones and cut on the embossed line to make a mid sized flower. I put the pieces on my piercing mat and used an embossing tool to curve every other petal. Then I flipped the flower and embossed the other 4 petals. 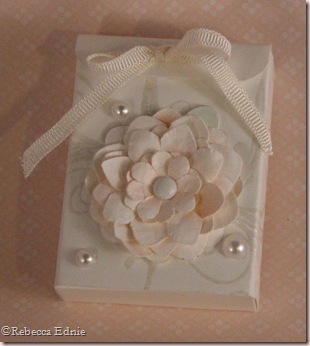 This gives the petals some dimension and by embossing some up and some down it keeps the flower from looking too perfect. 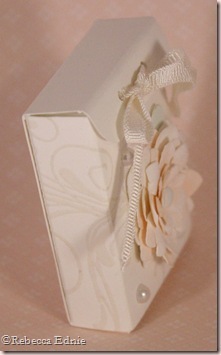 If you want a more perfect flower, emboss them all up or down, not some of each. I cheated a wee bit and used a tiny bit of airbrushing on the flower and leaf. R00 and G00. This picture isn’t nearly as good but it does who the shine of the EP. Click for the Matchbook Template. oooo, gorgeous little box! it is so dainty and pretty! This is beautiful Rebecca. Love the pretty 3-D flower.